Something interesting about the bottom photo above: if you stare at it closely for about 3 or 4 minutes, you'll notice that I'm also in it! A little breather from the reviews now; not to worry, more to follow, including the 20th anniversary of one of my favorite "guilty pleasure" films and a couple more TV series on DVD. So stay tuned, folks! 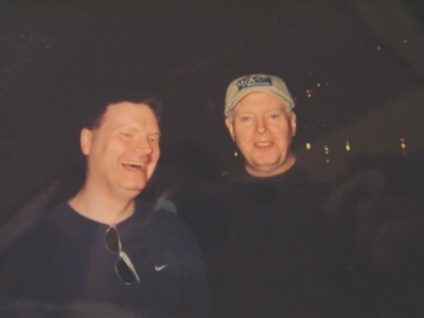 During a recent trip to Vegas, I met 1995 World Series of Poker champion (he's made the final table 3 other times!) Dan Harrington (top photo) and the gorgeous pro player Evelyn Ng (the aforementioned bottom photo). Yeah, I look different than in the Storchy pictures below, but hey, it's been 6 years! Great photo of you with Dan Harrington. Pattern the game after him and you will beat these idiots.